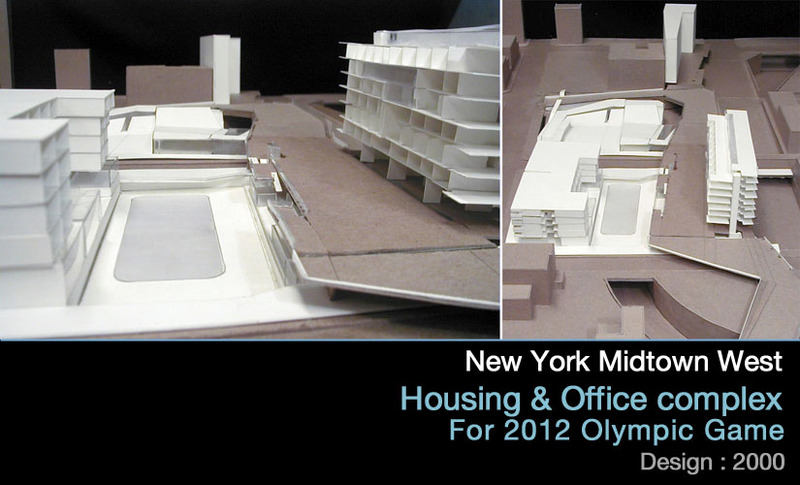 New York city was trying to invite the 2012 Winter Olympic game. 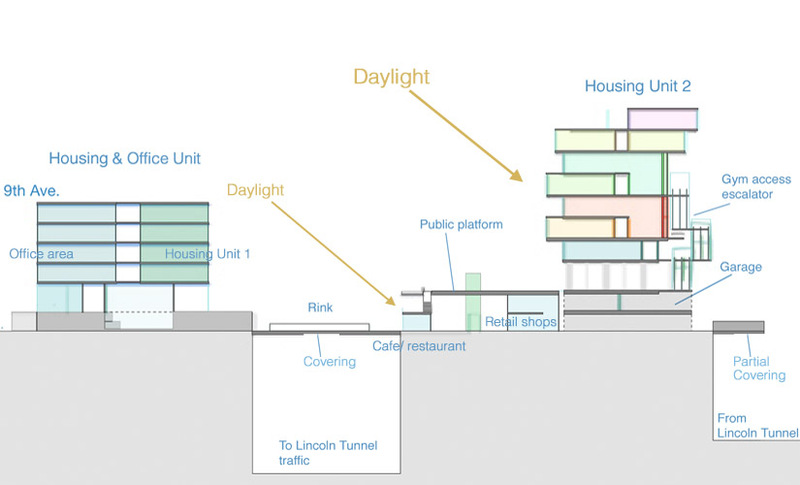 This project is the proposal to redevelop the "abandoned" area at the Lincoln Tunnel entrance areas, where the ground is digger down deeply by the interweaving roads going down to the underground tunnel--therefore the ground space of this area is divided into unconnected islands. 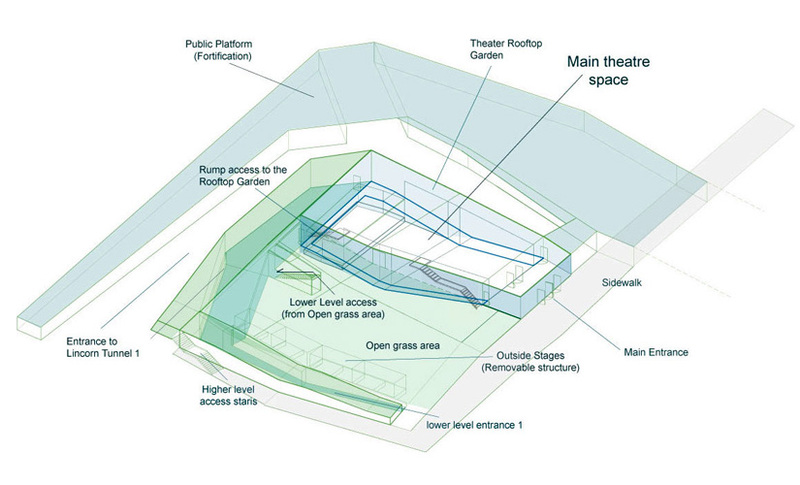 The main concept of this proposal is to connect those isolated island spaces by a large platform which covers the open pits and creates new ground. 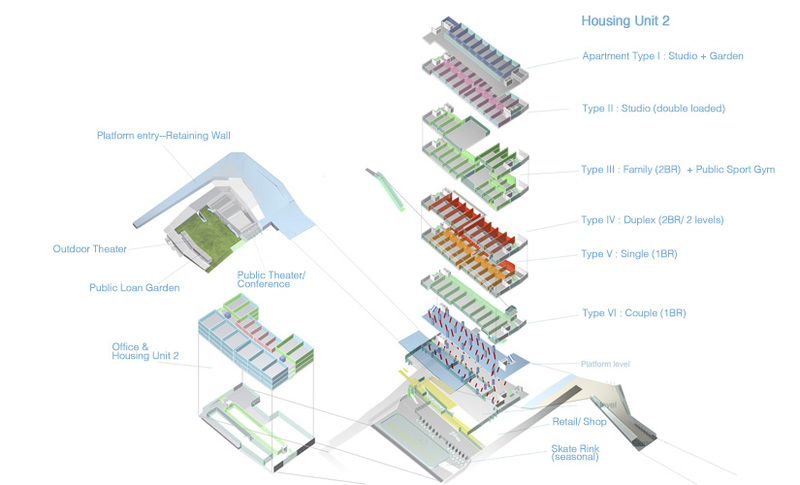 The design also takes advantage of those negative elements of the site, to utilized the height difference for layering of various programs and improving the site conditions for daylight conditions. 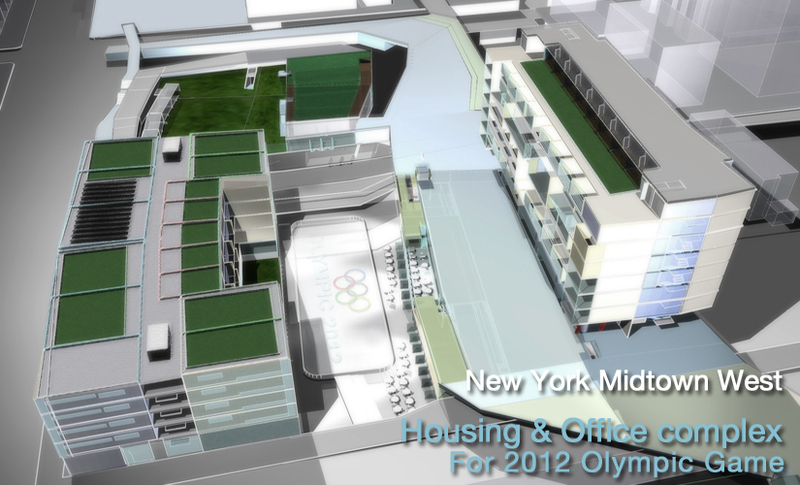 This compact complex is also paying attention to the sustainability ideas as an Olympic site proposal, with rooftop gardens and solar panel power generation. 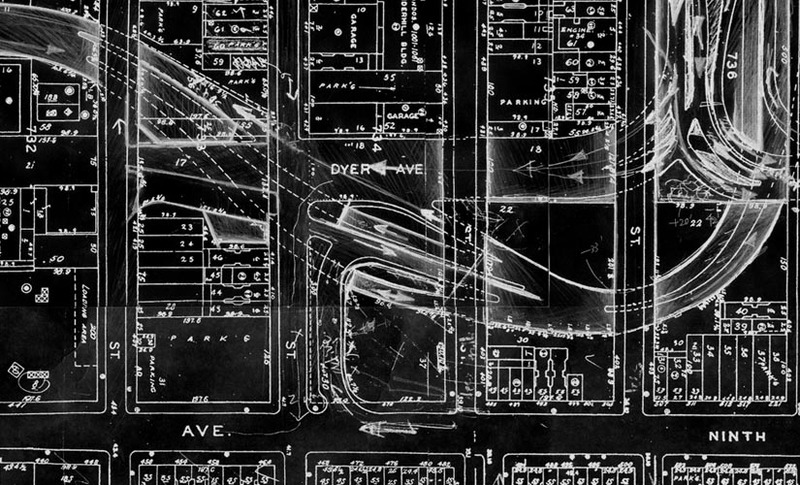 The strict grid system of Manhattan and the transformation stage of the Lincoln Tunnel going to New Jersey state can not coexist without severe compromise for its contrasting nature as seen in this map. Quite forcible layering of those contrast elements created severe site conditions. 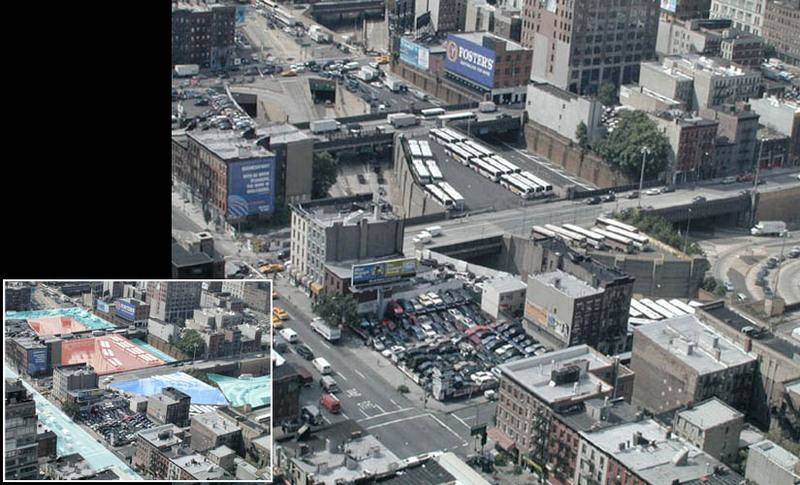 The site area is often deeply dug down for isolating the road connecting to Lincoln Tunnel. This produced high walls at the roads, while the ground surface was divided into pieces--only solution was to connect those island pieces by bridges. The heavy traffic road is not covered, therefore the above space of the road can not be utilized, while many issues such as air pollution, noise, vibration affects the surrounding environment. 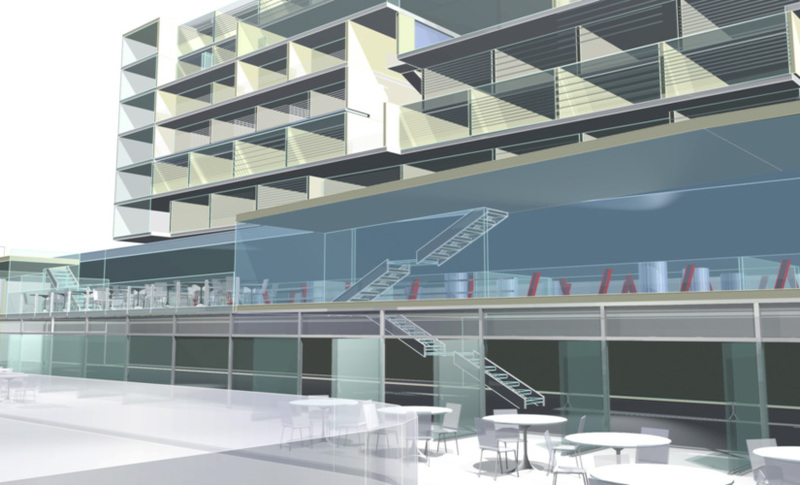 In this project, the existing condition is positively utilized for providing various layered conditions with height differentiation by the application of platforms and coverings. By dealing with multiple programs through the operations of layering and insertion, diverse programs are presented and co-existing in a very limited territory area. It is inteded to bring out a variety of programs co-existing, which can not be achieved by simple layering of monotonous program. 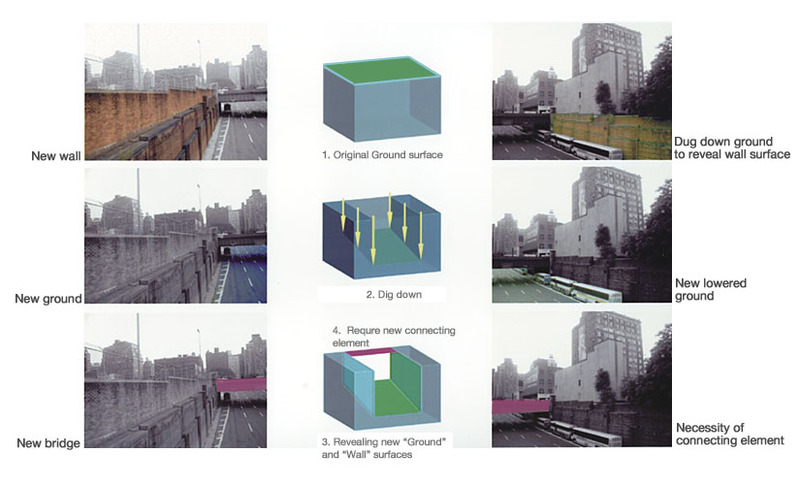 The entrance area from 9th Ave. to Lincoln Tunnel is isolated from the site by the retaining walls of the platform, while another internal mound produces the conditions of "outer" and "inner" moats for further isolation. Inside of the inner moat is covered with grass as a loan park, with a public theater which is buried down into the ground for minimum exposure.